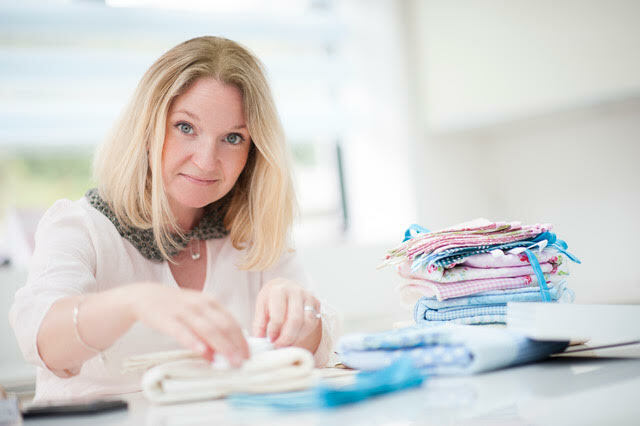 Find out how the gifts she received when she had her baby inspired Caz Taylor to launch Taylor’d Bundles, a range of bespoke, luxury new born baby gifts, special baby gifts and gift sets for cherished mums. I worked as a client director in marketing agencies for 15 years, representing a range of household brands, before launching Taylor’d Bundles in 2014. It didn’t really, and that was the problem. Being client-facing, you were expected to continue to entertain and be on hand on a moment’s notice. I had a great support network behind me, but whilst my client and company were happy with me running around, I was finding it hard having to put my family second a lot of the time. Where did the idea for Taylor’d Bundles come from? In my previous job we were always looking to make a great impression with clients, so when our contacts went on maternity leave, I looked for memorable and creative gifts just right for them. I found it hard to find the time to find a supplier who would create something amazing in a short amount of time: a gift that would stand out for all the right reasons. Then, when I had my first child we received a selection of gorgeous gifts, however our very favourite were handmade. Bespoke, personalised and beautifully created. I had never seen such lovely gifts so I started to contact the makers and find out more about the costs and processes they went through to create their wares. I started to speak to some of the makers of the gifts we received and my eyes were opened to the hugely impressive handmade community. Handmade wasn’t all about crocheted booties and fuddy-duddy hand-drawn pictures. It was full of beautifully creative gifts that were being created by hugely talented individuals. I slowly began to create a team of talented handmakers and then began to sell the bundles to friends and family as a sideline. People were loving what I had to offer and it slowly began to give me confidence that I could create something of real value here. My dad had his own successful business, so I had always loved the idea of creating something for myself. Fast forward two years and with the long hours and stress from constantly being on the go during our day jobs, our desire to add to our family wasn’t quite going to plan and then 3 years on I fell pregnant but sadly this wasn’t to be. I experienced a late miscarriage, took a day off to get my head around it and then headed back to work. When I arrived, there was a box waiting for me on my desk. No one at work knew what had happened so I was intrigued as to what it was. Inside was a selection of three blue cheeses with a note that said. ‘Caz, these are the only blues I want you to have. I love you. Love Ruth’. A hugely discrete, thoughtful and incredible gift that as absolutely spot on. it just reminded me how powerful great gifts can be. So, I went home, finished my business plan, got it approved by the bank the week later and then handed in my resignation. Being the reason someone smiles is what all our gifts are all about and from January, our customers will be able to buy their very own Only Blues Boxes too – it seems only right to offer others this brilliant concept. I had a business plan that listed out all the needed costs and plan of attack which had been approved by the bank and my husband (he needed to be on board as he was going to have to cover the bills whilst I started out). We had been loosely saving to make this move but now it was all systems go. During the last four years of my marketing career, I also worked on a range of digital campaigns, the knowledge and experience of which I used to design, build and launch my own website. My husband was happy for me to go for it as I had a clear plan and worst case scenario was I would go back to work if it didn’t work or even began to cost us money. It was a feeling that I need to get out of my system and to this day, working for myself still gives me huge amount of satisfaction. We genuinely gift the unexpected – whether the gift is sent to someone when they least expect it, or if its about marking a special milestone, our gifts are full of creativity, many of which are exclusive to us. They are ALL also delivered within seven working days or less. No one else offers such a quick turnaround for gifts that are so personal. We have full commitment from our collaborators and processes in place to create gifts efficiently and I’m pleased to say we’ve nailed the delivery process too. Anyone who is looking to send a memorable gift who is time poor. We have done the thinking for our customers so they simply need to choose which bundle they want and we do the rest. Due to a number of new corporates wins, we are about to reposition our business to an award-winning Concierge Gifting Service. We are keeping our maternity offering, but extending the occasions we offer gifts for. We want customers to come with the occasion in mind and then browse the gifts we have to offer in the hope they buy something that they wouldn’t normally expect to send or gift. We have been creating and sending out these gifts for our corporate clients to give to their staff for the last year – such as Jack Wills, YMCA, Revlon and Danone – so now it’s time to go out and share with the world what we have proven there is an appetite for. A number of ways; email newsletters to our customers, social media (Instagram has been a huge success for us – we get 45% of our sales from IG), word of mouth and direct mailing to our key contacts and businesses. We spend the time finding out about these people and where they work and then gift them with something that really stands out. This approach has won us some huge accounts and really supports what we are about as a business. We’re now moving into PR, as well. Supplier issues – only for a few suppliers, luckily. I’ve spent a lot of money in the past on stock and photography on collaborators who left soon after. We now have SLAs in place to protect both sides – if everyone knows what’s expected, it makes the business relationship a lot easier to uphold. Winning the Jack Wills contract. We were approached by Jack Wills to pitch for part of their employee benefit packages. We worked on the costing, process and bundles themselves. We created a document that was pitched across a two month process. It finally went to then CEO who approved our approach. We have worked with them for over two years and has been a huge supporter of Taylor’d Bundles. We now create maternity and baby gifts for Jack Wills staff across the whole of the business. I am not afraid of hard work and by working for myself, I reap the benefits directly of what I put into the business. I get such a kick from pitching, hearing from customers, even now I get a real flutter in my tummy when orders come through. The thought that I have created something that people want to get involved in, is such a thrill. I also love the fact that my eldest knows all about Taylor’d Bundles and asks me about the business and how she can get involved – let’s hope I can hand it down to her in years to come. John Ruhlin, a hugely successful business owner who owns a gifting business that uses a theory around gifting (giftology) that I absolutely adhere to. His theory has helped me take my business to the next level for sure. I also have a thing for Alan Sugar – maybe it’s because he’s pint-sized like me?! It’s a tricky one, however keeping my husband involved with what my week involves does help. If I need to be somewhere we make sure that he’s home to cover. He says that this is my time as I have supported him to get to where he’s got to. I love this about him. Saying this, there are days when I am up until the early hours. However these are normally before a pitch or launch and with my background working in agencies, I almost expect this to be the case! Owning your own business is such a huge learning curve that if you need to be learning on the job essential skills that are needed to get your business up and running, you will burn out before you start. Work to your strengths and lean on others to help you get things done. I think about where my business has come in the three years we have been trading and we most definitely would not be where we are today had we not said yes to opportunities that were out of our comfort zones. ‘Get comfortable being uncomfortable’ was a piece of advice that one of my uber entrepreneurial friends gave me and it’s this thinking (stretching yourself, and taking calculated risks) that grows both you and your business. You won’t ever have enough money, or know everything that you need to know so think about how you can get what’s needed to be done with the contacts and assets you have. Offer shares in your business for people to offer their skills for free, delay payments to help with cash flow in return for some free products, do knowledge sharing lessons. People have a lot to offer and many people love to help, so don’t be afraid to ask and get yourself out there. He who dares and all that! You can find out more about Taylor’d Bundles on their website.